The Daily Struggles of the Domestic Un-Goddess: chickpeas and crêpes.....why not? I never really went anywhere, I just needed a little break. But I'm good now, relaxed and I'm HUNGRY for more bloggin'. I'm not sure about you guys, but I just go through stages of laziness, apathy and general distaste for all things domestic (and trust me, my house is a true testament to this lack of inner fortitude). I do, however, have a full slate of food to make this week. Hubs and I are back into eating healthy (apparently, me eating dill pickle popcorn for dinner is not an acceptable form of nutrition....who knew? ), homemade foods that are easy on the pocketbook. Tonight we were actually supposed to be eating rice and dal (perennial fave), but when I sent the week's plan to hubs, he immediatedly zoned in on Thursday's dinner and asked if we might be able to have the mushroom crêpes chasseur for dins tonight. This didn't seem to immediately present a problem (I'm never averse to switching around dinners), except that we hadn't actually purchased any groceries yet. SO, I worked until five, met hubs at 6, finally got home at 7 and then tackled this recipe. Which happened to be a mite bit more complex than my regular crêpe recipe. 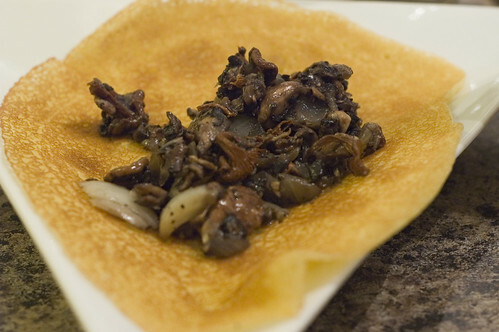 I mean, the crêpe part was pretty much the same, except I had to soak dried mushrooms, make up this mushroom mixture, then make a sauce with the initial mushroom soaking liquid. The crêpe recipe is a little odd - I was somewhat perplexed by the use of chickpea flour, but dutifully picked some up on my way home. Funny enough, at the bulk store, I had to tell the cashier what the heck it was, and that prompted the people in front of me to inquire as to what exactly one might do with chickpea flour. 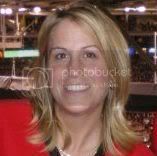 I could have told the truth and told them I'd never used it before and was merely hoping for the best. But I decided to be an obnoxious know-it-all and informed them that it was excellent in crêpes. Thankfully, I'm not a liar. Part of the healthy eating plan for hubs and I is to also reduce wine consumption (perhaps this could also be slated under the tightening purse strings plan too)...so hubs insisted that I cork the bottle of wine needed for this recipe and hide it on him. So I did. It's behind the flour, so he'll definitely never find it. Unless he reads this. But he probably won't (more likelihood of him looking behind the flour). So the wine should be safe. For a day or two, until I decide I want it. Upshot of this is that I don't recommend this recipe for a weeknight. It's a little time consuming. Not difficult, just long. I would definitely turn it into a little vegetarian french dinner for two though - pair it with a nice salade verte, some onion soup and a nice little pastry-type thing to polish it off. Mmmmmmmmmmmmmm. 1. Lightly spoon flours into dry measuring cups; level with a knife. 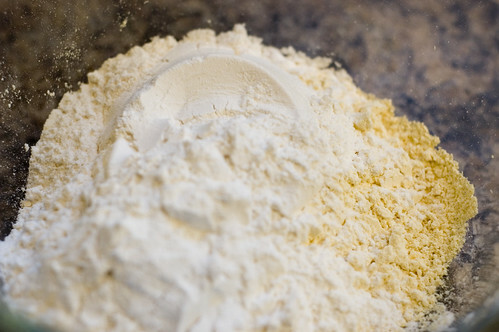 Combine flours and 1/2 teaspoon salt in a medium bowl. Add 2 cups water and 2 tablespoons oil, stirring with a whisk until smooth. Let stand 20 minutes. 3. Place crepe on a towel; cool. Repeat procedure until all of the batter is used to make 12 crepes. 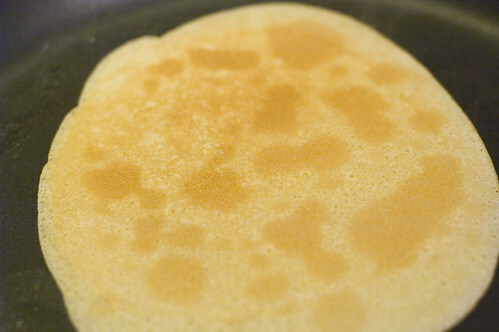 Stack crepes between single layers of wax paper to prevent sticking. 4. Bring broth and 1/2 cup water to a boil in medium saucepan; remove from heat, stir in porcini. Let stand 30 minutes. Strain mixture through a sieve into a bowl; reserve broth mixture and porcini. Add red wine and honey; set aside. 5. Heat 2 tablespoons oil in a large nonstick skillet over medium-high heat. Add onion; sauté 3 minutes. Add reserved porcini; sauté 1 minute. 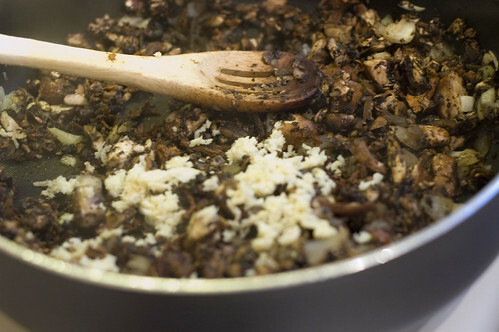 Add button and shiitake mushrooms; cook 4 minutes or until mushrooms release moisture, stirring occasionally. Reduce heat to medium, stir in pepper, nutmeg, 1/8 teaspoon salt, and garlic. Cook 1 minute, stirring frequently. Add 3/4 cup broth mixture; reduce heat, and simmer 15 minutes, stirring occasionally. 6. Bring remaining broth mixture to a boil; cook until reduced to 1 1/2 cups (about 12 minutes). Combine 2 tablespoons water and cornstarch, stirring with a whisk. Stir cornstarch mixture into broth mixture. Bring to a boil; cook 2 minutes or until sauce thickens. (I used more cornstarch, and I also added 1 T of butter to make it a bit richer). 7. 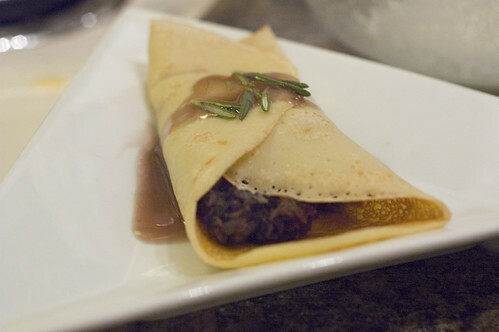 Spoon 1/3 cup mushroom mixture in center of each crepe; fold sides and ends over, and place, seam side down, on a plate. Repeat procedure with remaining mushroom mixture and crepes, placing 2 crepes on each of 6 plates. Top each serving with about 1/4 cup sauce; sprinkle with 2 teaspoons parsley. I only ate one though. I skipped the parsley because I hate it. This was really tasty. I want more. Thanks for reading and thanks for stickin' with me. I promise you it's worth it. Yum! Mushroom (and cheese) crepes were a favourite snack while we were in Paris. I think I'll be making these sometime soon! Yummy, yummy yummy. How many crepes does this make? How many of said crepes should one consume at a sitting?? Wow - what time did you end up eating dinner? 10? I might have fainted before then, looks like it was worth it though, looks great! We love Chasseur! I will definitely have to try this one out one. Glad you feel rested and are back with us. Oh, this does look good and possibly easy to convert to gluten free too. I will have to try this on my hubby. The photos look great and the recipe sounds really tasty.